Part Two of this two-part series, on the efforts of the KDP to annex Assyrian Christian areas of the Nineveh Plain to the KRI, can be accessed here. The long struggle of the Kurds to achieve liberated status in a region that has oppressed them for generations has inspired many around the world who have sympathized with and supported the Kurdish cause. For those of us who have long believed in the right of Kurds to attain the same dignity deserved by all human beings, a referendum on Kurdistani independence should be a joyous occasion. But unfortunately—and sadly—the upcoming referendum is tainted by deceptive political agendas. The referendum is not simply about Kurdish independence; it is being used as camouflage for an attempted land-grab of minority regions that are not part of the Kurdistan Region. Some of these minorities are not Kurdish, such as the Christians of the Nineveh Plain whose homeland is now being targeted with annexation. Others are Kurdish-speaking but do not consider themselves proponents of Kurdish nationalism, the particular identity markers and language of which are articulated or appropriated by dominant political parties. What these different minorities have in common is their rejection of being annexed into the KRI and ruled by the Kurdistan Democratic Party (KDP). The hope of Kurds is that independence will be a moment of healing after a long legacy of suffering in which Kurds, as a minority in Iraq, were targeted with tremendous political violence and oppression. But of course, Kurds are not a minority in northern Iraq, where other minorities are now targeted by Kurdish security forces in ways that are reminiscent of the oppressive measures previously used against the Kurds themselves. This is the tragic fact of today’s political situation in Iraq: The legacy of Kurdish suffering is dishonored by the unethical tactics used to crush minority opposition to assimilation into a Kurdish political order. 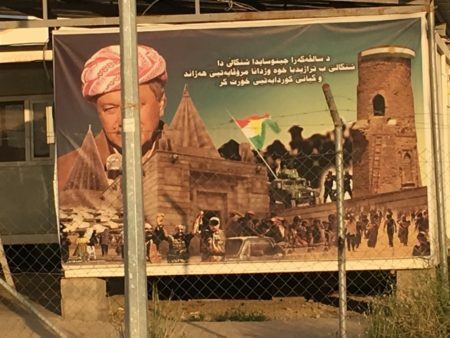 At camps for displaced Yazidis, the KDP asaish often restrict visitation of foreign journalists and researchers, arrest Yazidis engaging in peaceful demonstrations, evict families if a member joins a rival political faction, and erect signage such as that seen in the above image. This begs the question: can a fair vote among Sinjar’s Yazidis in the upcoming Kurdistan independence referendum really be conducted? The beginning of this past August marked the third anniversary of the Yazidi Genocide. In Dohuk on August 3, 2017, KRG Prime Minister Nechirvan Barzani gave a speech at an event commemorating the Yazidi Genocide. Nechirvan Barzani speaks at Yazidi Genocide commemoration, Dohuk, August 3, 2017 — Photo: Rudaw. In the speech, Nechirvan attempted to shift responsibility for the abandonment of Sinjar from the Peshmerga onto the Iraqi army. In the process, he made a number of false and misleading statements that sidestepped some uncomfortable realities about the Genocide—problems that will not disappear but which will become part of the historical memory of that fateful day. Revisiting the heartbreaking moment when the Peshmerga vacated Sinjar as the jihadists approached, Nechirvan repeated the tired claim that the Peshmerga were not sufficiently equipped to defend the Yazidi people, because they lacked adequate weaponry. Nechirvan should be asked how it was possible that handfuls of Yazidi farmers with hunting rifles were able to prevent IS jihadists from conquering certain parts of the mountain. In 2015 and 2016 I met and interviewed many Yazidis in Sinjar who live off herds of sheep and goats, or wheat, barley, and vegetable farms, who showed me how they were able to keep the jihadists out of a number of little villages—tiny enclaves nestled into the foothills of the mountain. If local people with no combat training, military equipment, or advanced weaponry were able to use the high ground to prevent the jihadists from taking the mountain, imagine how much more effective the defense could have been if the Peshmerga had stayed. Even if the Kurdish commanders felt unable to defend the larger Yazidi communities in the plains near the mountain, they could have remained on the edges of the mountain and provided cover to fleeing civilians, keeping IS away while facilitating the evacuation of the many thousands of fleeing families. Instead, they fled the entire region and left the civilians defenseless, after promising to protect them. In his speech, Nechirvan focused on the collapse of the Iraqi army, and avoided drawing attention to the fact that it was the Peshmerga who controlled Sinjar, not the Iraqi army, prior to the Genocide. He also emphasized that Iraqi weapons fell into the hands of IS after the Iraqi army collapsed, which he says made it impossible to defend Sinjar, but he failed to mention that many of these weapons likewise fell into the hands of the Kurds. If fact, entire weapons depots in Nineveh were seized by Kurdish forces. Further, the Peshmerga in Sinjar had looted the weaponry and vehicles of sections of the Iraqi army stationed in the Sinjar area, as well as those of Iraqi troops who did not dissolve, but who stayed and defended Tal Afar until eventually being forced to withdraw. The “we had no weapons” excuse is baseless and a lie. 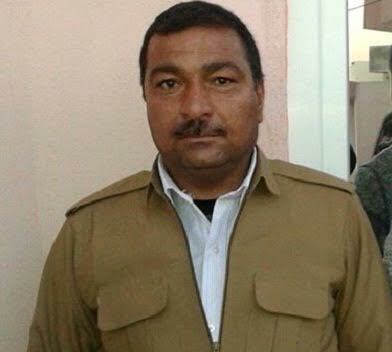 Nechirvan blamed the inferiority of Peshmerga weapons for the withdrawal. This makes one wonder why the Peshmerga then refused to leave any behind for the Yazidis, many of whom were committed to remaining and fighting to protect their families. On the south side of the mountain, a large group of Yazidi men—armed with only their personal weapons—held off the IS advance for hours, until it appeared that IS might give up trying to attack that area, but were finally defeated because they ran out of ammunition. If the Peshmerga felt that they had to leave the area because of inadequate weaponry, why did they refuse to leave behind any of those sub-par weapons to the Yazidis who were begging them to leave anything that would help them defend their families? As I have written about before, the IS attack was not a surprise, but was well-known in advance. The Peshmerga withdrew once it was known that Sinjar would be attacked, but too late for civilians to properly evacuate. The Peshmerga took their weapons with them because the withdrawal was planned and organized, not a spontaneous, haphazard collapse that might have occurred if the enemy had been engaged and proved too powerful. As Yazidis begged them to leave weapons behind, and asked why the Peshmerga refused to do so, Peshmerga commanders responded, “This is against our orders.” In Zorava, a Yazidi town on the north side of Sinjar Mountain, several Yazidi men—desperate for weapons to protect their families—tried to seize some Peshmerga guns as the Peshmerga were heading back to Kurdistan. The Peshmerga fired upon them, and at least two Yazidi men were killed. It is a tragic fact of the Yazidi Genocide that on August 3, prior to the IS slaughter that would ensue, Yazidis had already been killed by the Peshmerga responsible for protecting them. Just as farmers were able to keep IS out of a number of little enclaves in the foothill of the mountain, the mountain itself never fell to IS. If it had fallen, not only would the displaced Yazidis who fled there have been slaughtered, but IS might still hold that defensible territory. The mountain was saved, in part, because of an accident. As the Peshmerga withdrew, one of their vehicles broke down on the main road leading from Sinjar City up the mountain. The vehicle had a heavy weapon mounted on the back. The Peshmerga just left the vehicle sitting in the road. Later the same day, as the jihadists began pursuing the Yazidi civilians who were fleeing up the mountain road, a poor Yazidi mechanic with no military background climbed into the vehicle, took hold of the gun, and aimed it at the ascending IS forces. Because of the high-ground advantage, this single weapon was enough to halt the ascent of the jihadists, buying time until US airstrikes helped guarantee that IS was not be able to advance on the mountain itself. The mechanic may have single-handedly saved the mountain from IS. Sinjar Mountain was saved by a weapon left behind by the Peshmerga, not in response to the pleas of the Yazidis, but because the Peshmerga did not have time to fix a vehicle. If handfuls of farmers can keep jihadists out of mountain villages, and if a mechanic with one gun on the back of a broken-down pickup truck can stop the IS army from climbing the main road up Sinjar Mountain, imagine how much more effective the defense would have been if the Peshmerga had stayed and fought alongside the local Yazidi people. Later, the KDP put the poor mechanic, named Qasim Derbo, on their payroll, as they typically do, and made him a “commander.” Rural people with no feeling of personal power, no education, and no voice in politics can be easy to intimidate or control. A common KDP tactic is to try to convert any person of influence or popularity—a religious figure, tribal leader, renowned fighter—to the party in order to attempt to create legitimacy in the eyes of the people. You can imagine how, after Qasim Derbo’s act of heroism, he would have been a prime target for such a tactic. Once Qasim Derbo was assimilated into the KDP collective, they then built a monument to the incident, memorializing the vehicle and placing a large image of Masoud Barzani next to it. Such is the brazenness of this hypocrisy: Presenting an instance of cowardice and negligence as the selfsame group’s bravery and heroism. In the first couple of years after the Genocide, the KRG would not use the language “Yazidi Genocide” (which is still often the case within the country, as the first image in this article, of the sign in Chamisko Camp, demonstrates). In previous commemorative events on the Genocide’s anniversary, officials called it “the Sinjar crisis” or the “Sinjar genocide.” Though it is nice to see the Prime Minister now calling the event the “Yazidi Genocide,” the ongoing attempts to avoid responsibility do not help. Nechirvan’s statements are offensive to the survivors of the Genocide. Whether a calculated decision or simply sheer cowardice, the Peshmerga withdrawal allowed the Yazidi Genocide to take place. Everyone knows the truth about Sinjar, and the excuses that KDP officials continue to repeat are downright embarrassing. Yazidi survivors of genocide do not need more empty and false excuses—they need a genuine apology. That KRG officials cannot honestly face up to these facts continues to be a painful thorn in the side of those who lost everything. Claiming that Sinjar will somehow meaningfully express its will regarding the Kurdistan independence referendum belies the fact that it is impossible to conduct a vote among the scattered Yazidis now inhabiting camps in the KRI, Syria, Turkey, Sinjar, as well as among those who have taken refuge in Europe, Australia, and North America. Since Sinjar is a disputed territory, and not part of the Kurdistan Region, it is unclear why or how the people of that area would be able to weigh in on Kurdish independence—no referendum has ever been held to allow the people of Sinjar to vote on whether they want to join the Kurdistan Region or remain under Baghdad’s administration. (The widespread rejection of KDP influence in Sinjar following the Genocide indicates that if such a vote were to be held—and held fairly and inclusively—it is most likely that Yazidis would vote to remain separate from the KRI.) Furthermore, since political competition over Sinjar has kept the area unstable these past three years, inhibiting Yazidis from returning, conditions for conducting a vote of any kind in the area are unfavorable. Nechirvan also omitted that it is the KDP—not Baghdad or another party—that has actively prevented the return of Yazidi IDPs to Sinjar. Yazidis have repeatedly asked the international community for support in creating their own nonpartisan security and local administration, but nothing has been done to facilitate this. Instead, Yazidis have now begun their fourth year living in camps while political parties with militias vie for control of Sinjar. Yazidi emigration from Iraq continues, as discouragement regarding Sinjar’s chances of seeing restored stability sets in. It is unethical to use the independence referendum and the instability of Sinjar following the Genocide—while its people are still far from having recovered from the trauma—to unilaterally force the annexation of Sinjar, a disputed territory, to the KRI. Western officials should hold the KRG accountable for this unscrupulous approach and ensure that Sinjar can be protected from these ambitions. The disputed territory of Sinjar needs to be dealt with fairly and separately from the issue of Kurdistan’s independence, with local people having the opportunity to legitimately choose their leadership and future. Nechirvan used his commemoration speech as a political platform to attack Baghdad ahead of the KRI Referendum, rather than using the Genocide’s anniversary as an opportunity to approach the Yazidi people with humility. Instead of helping Yazidis return to Sinjar and build a secure future, their Genocide is still being exploited for political gain. This is disrespectful to the survivors of the Genocide and only causes more pain. Curious, will the KURDS again be abandoned by the U.S., as they were back when Saddam still ruled the country and then gassed the KURDS??? Proxies are just that, until they serve no further purpose, then like so much garbage, are thrown away. Interesting article. It is well established the US and Israel did send ISIS to Iraq in order to achieve their final objective, split Iraq in at least three parts. This failed because of the arrogance and stupidity of ISIS. Also Chief of General Staf of the US army Martin Dempsey testified in 2014 before the US Senate, saying the US intervened because ISIS started attacking Erbil. One Should also look at events at the same time in Kirkuk which was taken over by the Peshmerga. My feeling is that the Barzani’s, ISIS, the US and Israel all worked together to achieve this long term aim of the US/Israel. Part of this deal seems that Sinjar was given to ISIS. One should also look at the intervention in the area by the YPG/PKK. This is missing here. I like the selective humanity this site has always represented . You could not make this blog see things your way so of course you are not going to like it. I know very well that pdk, barzani, betrayed yezidi people in sincar ,shengal, in August 2014. 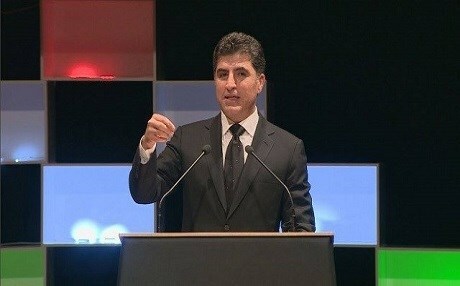 I share many comments you did about nechirvan barzani. But I suspect your intentions by not mentioning at all Pkk and ypg done for yezidi people, sacrifice their life and rescued thousands vulnerable ezidi civilians by opening corridor. That Mr barber stinks! You even didn’t mentioned one word about their roles. There are some ezidis consider themselves only yezidi , as religion group, which you advocate them particularly as an orientalist, lovely western leftist who wish keep them a small folkloric group. However there other yezidi consider themselves as Kurds. They have big role in Kurdish movement, especially in pkk. You want to keep ezidi as as Amazon indigenous natives..
Jihadists were used by all to achieve tactical goals but in every case those jihadists came back to fight those who helped them and at any given opportunity they fought among each other. Militant and Wahhabi Islam does not recognize the principle of freedom and democracy, Assad and his allies knew that at the end of the day nobody will support the jihadists except the population of the poor and uneducated youth and that population is unable to win a long war, they are tools and vicious killing machines. The only outcome of accepting those jihadists was to inflict destruction and misery wherever they are allowed to exist, the opposition went through phases with those jihadists, first they were welcome as “brothers” because they were fighting a mutual enemy, then when things went south and the jihadists kicked the non Islamists out many thawrajiyyeh got uneasy, now most thawrajiyyeh are cursing the jihadists !! When you want to replace a bad regime you need to come with something better and understand that most Syrians at their core are not jihadists or Wahhabis. Dear thawrajiyyeh, You should have listened to the voice of reason in 2012 when you had an opportunity of building a broad coalition, it is too late now. Big thanks to the moderator, please keep such articles coming. It’s important to expose the real inhumane face of these pawns. Following the closure of Yazda, a Yazidi humanitarian and human rights organization, by the KDP asa’ish (security police affiliated with Kurdistan’s largest political party, the Kurdistan Democratic Party) on January 2, 2017 in Dohuk, people have been asking many questions about why this took place. Fortunately, the government has now reversed its position on the closure and Yazda has reopened. Nevertheless, this episode points to some serious political issues that impact the status of the Yazidi minority in Kurdistan. I will explore these issues in this article. Great work, Matthew, but the men in Zorova were killed on August 3 according to the witness I interviewed and the neighbor of one of the men who was killed. Also, I have quite a different version to the doshka, now a monument. There are lots of holes in that story of heroism. I have interviewed a variety of people nd write about it in my book, soon finished I hope! Is there any proof about the mistreatment pn Christian minorities… I have great doubt about it.